Two quick announcements. One, I have a new class that I will be teaching in December. Tarts and Galettes will be our topic and the food will be truly epic! If you have ever been afraid of making pie or tart dough, this is the class for you. I have a foolproof recipe and will demonstrate lots of ways to use it. Information here. Also, if you are looking for some ideas for the big Thanksgiving holiday next week, I have a Thanksgiving category found here. My brother Alex is a very accomplished eater. Actually, both of my brothers are. They are those annoying people who have huge appetites, eat well, and are very slim and in great shape. I should mention that they both work hard at staying in great physical shape. I should also mention that I did not get the eat everything you want and stay slim gene. Nor did I get the tall gene. But I did get the small nose gene! Ahem. Back to Alex. As a child, he was incredibly picky. The list of food he would eat was pretty much confined to apple juice, applesauce, yogurt, and rice. Maybe a fruit or two. I think about this often when I think about the pickier of my two eaters. At least Spencer eats tofu and soba noodles and broccoli and mango and whole wheat bread and chickpeas and lots of fruit in addition to the buttered noodles that he would prefer to eat. I trust that Spencer will someday be like Alex. Some switch will flip for him and what he scoffs at now, he will love later. Interestingly, there are two foods that Alex still doesn’t like. Mushrooms and artichoke hearts. Two foods that I love. I can’t say I understand the artichoke hearts, it’s not a common dislike, but I do get the mushrooms. I hated them as a kid – we all did. My mom made them regularly but she didn’t make us eat them. Nor did she make us eat the acorn squash halves that she filled with bits of butter and maple syrup and I would gladly eat two of now. Mushrooms are a pretty common dislike, enough so that I always ask a new friend how they feel about them before I cook for them. It is not just a taste thing but also a texture thing. Like I said, I get that. I feel lucky that I like them and that I have a husband who likes them. We eat a lot of mushrooms in our house. Um, two out of four of us do. 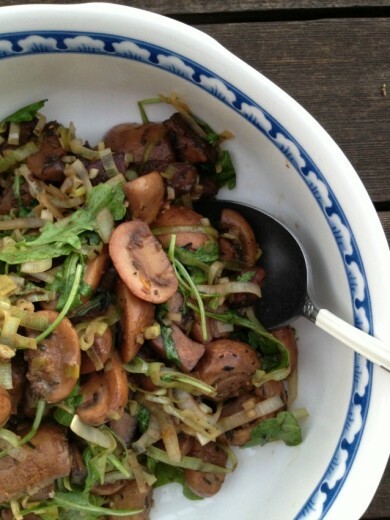 This is my new favorite way to use mushrooms and elevate them to a truly special side dish. First you bake some portabellos to caramelize them and bring out their deep woodsy flavor. Then you sauté leeks until they are silky and limp. Next up are a combination of cremini (which are actually baby portabellos) and button mushrooms – those get time in the skillet with herbs and eventually some red wine. 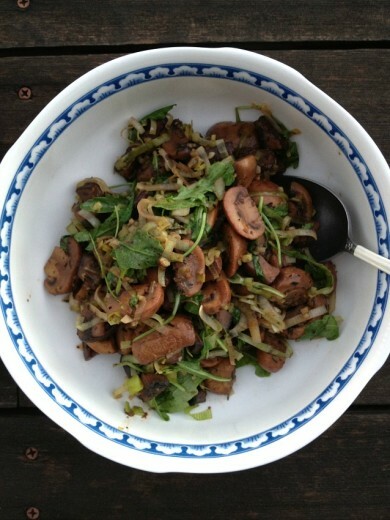 The mushrooms cook down until they are brown and tender and at the very end you throw in some arugula for a little green and a little peppery punch. It’s a great side dish and would even be amazing tossed with pasta. Too bad Alex will never taste them. Preheat the oven to 350°. On a baking sheet, brush the portobellos with about 1 tablespoon of olive oil and season with salt and pepper. Bake for about 25 minutes, until tender; let cool slightly, then slice 1/2 inch thick. Meanwhile, in a large, deep skillet, heat another tablespoon of the oil. Add the leeks, garlic and a big pinch of salt and pepper. Cook over moderate heat until the leeks are just starting to brown, 7 minutes; transfer to a bowl. Heat 2 tablespoons of oil in the skillet. Add half of the button and cremini mushrooms and a thyme sprig, season with salt and pepper and cook over moderately high heat, stirring occasionally, until tender and browned, 8 minutes. Transfer to the bowl. Repeat with the remaining 2 tablespoons of oil, mushrooms and thyme sprig. Return all of the cooked mushrooms to the skillet. Add the red wine and cook until evaporated. Add the broth, lemon zest and lemon juice and cook over moderate heat, stirring, until the mushrooms are coated in a light sauce, 4 minutes. Stir in the Marsala and cook for 1 minute. Off the heat, stir in the butter and arugula and season with salt and pepper. I meant to write to you on your last post – as I’m hoping many others did – to say I’m SO glad you are back!! I have really missed your blog. No pressure, I don’t know how you do it really – but just a note to say that your words (and recipes) are greatly valued! Wishing you a wonderful Thanksgiving! P.S. Thanks for the hope for my picky eater!! 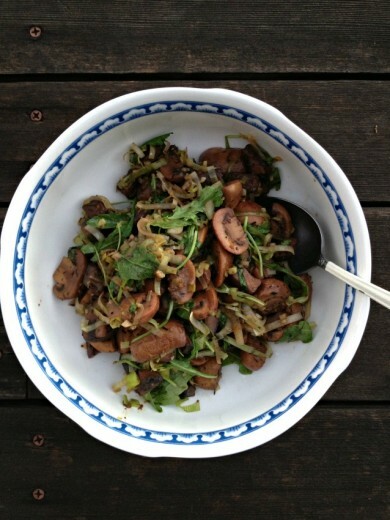 Well, I make mushrooms in sort of a similar way, but yours take my approach to much higher and better levels – what a great touch to finish the sautee with the arugula – GENIUS! this goes to my Pinterest folder right away…. I can definitely see why these are your fav! YUM! I’m definitely on the fence about mushrooms but I’m trying! It’s an ongoing battle. Maybe this will be the dish to put me over the edge? This was SOOO delicious! I had some leftover and I tossed it with pasta, a bit more arugula and sprinkled pecorino romano on top….yum!! Oh how I love funghi. I wish the other eater in the house would like them too……..
Mushrooms are WONDERFUL, aren’t they!? sounds amazing! since my husband and i are obsessed with mushrooms i bet that recipe that feeds “6 mushroom lovers” would only feed 2 mushroom disciples! I used this recipe last night, tho i added some soya sauce instead of salt, and it was really good. Yummy! I love mushrooms. Thanks for the recipe. I love mushrooms, but last time I made them they turned out so disgusting I think I’m traumatized! Need to get over it and try this! You can take a look at my site abour animals, in which I tackle issues such as fur trade or animal testing.